Will my new car warranty be void if I service my car at Auto Masters? 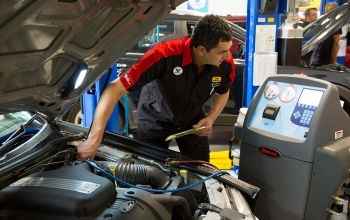 The easy answer is that a log book service by a certified Auto Masters mechanic will not void your new car warranty, and it’s not just Auto Masters who says this, the ACCC has just released its findings following a 12-month investigation into new car retailing. In relation to general servicing, motor vehicle dealers are entitled to insist that any servicing performed on cars they sell is carried out by qualified staff, according to the manufacturer’s specifications, and using genuine or appropriate quality parts where required. Provided these conditions are met, regardless of where you choose to get your car serviced, your warranty will remain intact. So shop around. Qualified and Licenced Technicians are a party or parties, other than an ‘authorised dealer’, who is capable of performing car servicing. Some servicing venues display qualification certificates, but if you’re not sure the staff are qualified, just ask. If an independent agent implies that it can perform general car servicing to manufacturers’ specifications and does not perform that function satisfactorily, then you have rights and remedies against the agent regardless if whether the agent has factory qualifications or not. The issue here is not who manufactured the part/s, it is whether the part/s are fit or appropriate for the purpose intended. If a part is non-genuine, but is interchangeable with the genuine part, it could be seen as being fit or appropriate for the purpose and would therefore not void the manufacturer’s warranty. However, it must also be noted that should the part/s installed fail or not perform satisfactorily, the consumer then has rights against the fitter and/or manufacturer of those replacement parts. If the non-genuine part fails, and causes some other damage to the vehicle, the dealer and vehicle manufacturer will not be liable for damage caused by the failure of that part. The above information is extracted from Australian Competition and Consumer Commission (ACCC) Consumer Express publication, April 2005, Issue 1445-9671. The aim of the ACCC report is to shed some light and remove the confusion around new car warranties and servicing and provide a more open and transparent service and repair marketplace. The full ACCC report on New Car Manufacturer Warranty and Service has been published online. Statutory Warranties are implied by law and give consumers a minimum level of protection for goods and services. Statutory warranties are different to Express Warranties. A dealer or manufacturer may give an Express Warranty which will have its own conditions which you should review. However, these conditions cannot override Statutory Warranties. Further information on warranties is available from the ACCC. Auto Masters is one of Australia’s largest car servicing chains and has one of the most comprehensive vehicle safety checklist. If you’re a new car owner, looking for a competitively priced log book service that won’t void your new car warranty, call your local Auto Masters service centre on 1300 288 662 or make an enquiry online. Does your Logbook servicing protect my new car warranty? Yes, Auto Masters are fully qualified to service new cars and offer competitive Logbook service prices. Our Logbook service adheres to all manufacturers’ requirements, ensuring your car receives the necessary service and doesn’t void your new car warranty. Does Auto Masters offer a warranty on work completed? PROVIDED Auto Masters is given the first opportunity to correct the problem by reporting the matter to Auto Masters before any rectification is carried out. Any expenditure incurred without Auto Masters approval will not be recognised. Any Auto Masters facility will, during normal business hours, replace any part supplied and fitted by Auto Masters which has failed and/or readjust those components noted as being defective at any time during the warranty period. This service will be performed at no additional cost to the customer upon presentation of the Auto Masters invoices for the previous work. Do I keep my new car warranty if I service at Auto Masters? Yes! You can save money and keep your new car warranty in tact when you service your car at Auto Masters.